The IPO, which will close tomorrow, has received subscription to the extent of 65% till today. FIRST CHOICE, ADVISES THE INVESTORS TO SKIP THE ISSUE SINCE IT IS IRRATIONALLY PRICED. The Kanpur based printing ink manufacturer's Rs 51.50cr follow on public offer,( 97,53,658 equity shares) in the price band of Rs 41-43, will be listed in BSE tomorrow. The shares will not be listed in NSE. The two state run companies - Hindustan Copper and Shipping Corporation, are likely to hit the market before Dec -2010. Hindustan Copper's follow on offer (20%) could get the government around Rs 4000 cr. Similarly, Shipping Coprporation's 20% disinvestment could get the government around Rs 1500cr. The new player in the domestic mobile handsets market - Micromax is planning an IPO. The offer may be around 2.15cr equity shares, at a premium. Labels: follow on offer hindustan copper, follow on offer shipping corporation, ipo micromax, ipos / fpos in nov /dec 2010. Labels: FORTH COMING IPO, INDIAN IPO INFORMATION, ipo analysis, ipo grade, IPO NEWS, ipo note, IPO RECOMMENDATIONS, IPO RESEARCH, IPO REVIEW INDIA, IPO SHARE, IPO UP DATES, IPO WATCH, TOP IPO ANALYSIS . INDOSOLAR LISTS AT DISCOUNT. CLOSES 19% DOWN TO THE ISSUE PRICE. WE TOLD YOU SO IN ADVANCE. IPO ANALYSIS: COMMERCIAL ENGINEERS & BODY BUILDERS CO LIMITED – EXPENSIVE JOURNEY – AVOID. The Madhya Pradesh based producer of vehicle and locomotive bodies, Commercial Engineers & Body Builders Co Limited (CEBBCO) is entering the capital markets with an IPO. CEBBCO is engaged in the production of vehicle and locomotive bodies for diverse applications for road and railway transportation. It designs and manufactures vehicle bodies for the commercial vehicles industry with an extensive portfolio of product offerings. The company also conducts refurbishment of wagons as well as manufacturing of components for wagons, coaches and locomotives for the Indian Railways. Currently, the company operates five factories - four are in Madhya Pradesh and one in Jharkhand. Dr. Kailash Gupta, one of the promoters has been with the Company since 1979 and has over 30 years of experience in vehicle bodybuilding for the commercial vehicles industry. Decent track record with reputed customers in the commercial vehicles industry. State-of-the-art technology for design and production. Strategic geographic location. It has recently commissioned an additional unit within close proximity of Tata Motors’ Jamshedpur plant. 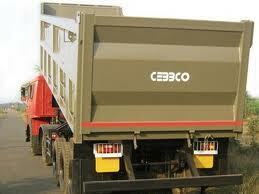 The demand for CEBBCO’s end products is closely linked to the overall industrial growth. This makes the company vulnerable to cyclicality in the CV industry. Low entry barriers and presence of a large number of competitors with weak bargaining strength with customers. Competitiveness is also hampered due to its dependence on a competitor for a key raw material component (hydraulic jacks). Motors accounted for around 70% of its total revenues from the CV fabrication business in 2008-09. Kailash Auto Finance Limited, being the only listed Group Company of the Promoters, is not in compliance with the listing agreement and filings to be made under the Takeover Code within the time prescribed. Funds requirement has not been assessed by external agency. The average cost of acquisition of the Equity Shares held by the Promoters, Dr. Kailash Gupta and Ajay Gupta, is Rs. 1.81 and Rs. 1.57 per Equity Share respectively. The Company has not declared any dividend in the last five Financial Years. The expected robust growth in CVs and increasing penetration of FBVs augur well for CEBBCO. Demand for tippers (which forms the major component of the company’s revenues from CVs) is expected to rise on the back of growth in end-use segments such as construction and mining. CEBBCO is an established player in the body fabrication business in India and has a strong relationship with one of the largest players in the CV segment – Tata Motors company in a good position to ride the industry growth wave. The company’s foray into the railway segment has also met with reasonable success. The company ventured into the railway business in 2008-09 and has had reasonable success in this segment so far. The EPS for FY 10 on the post issue capital of Rs 55cr comes to Rs 3.45. At Rs 125 -127, the company is demanding a valuation of 37 PE, which is very expensive. The company’s net profit margins are inconsistent. CRISIL IPO grade 2/5, indicating below average fundamentals. The company had negative cash flow for FY 10. INVESTORS ARE ADVISED TO SKIP THE ISSUE. THE ISSUE IS EXPENSIVE. Labels: INDIAN IPO INFORMATION, ipo analysis cebbco, ipo grade, IPO RECOMMENDATIONS, IPO RESEARCH, IPO REVIEW INDIA, IPO SHARE, IPO UP DATES, TOP IPO ANALYSIS . The two IPOs that closed today got good response. Tecpro System was over subscribed by 24 times where as Ashoka Buildcon got subscription almost 16 times, its offer. The other IPOs, currently open subscription - Sea TV, got 1.74 times, this issue closes tomorrow. Bedmutha Industries got subscription to the extent of 42% of the offer, on the first day. Indosolar whose IPO was closed on 15-09-10, will lists its share on 29-09-10. The company which came in the price band of Rs 29-32, has finalized the allotment @ Rs 29/- per share. IPO NEWS : SUBSCRIPTION STATUS - VA TECH WABAG 36 TIMES, CANTABIL, LITTLE MORE THAN 2 TIMES. Labels: INDIAN IPO INFORMATION, ipo grade, IPO RECOMMENDATIONS, IPO RESEARCH, IPO SHARE, IPO UP DATES, TOP IPO ANALYSIS . The buoyancy in the secondary market has infused fresh confidence to the issuers in the real estate sector. Some big names, like Mumbai based Oberoi Realty, Bengaluru based Prestige Constructions and New Delhi based Emmar MGF are likely to hit the market next month. The mother of all IPOs - Coal India IPO is likely to hit the market on 18-10-10. IPO NEWS : ORIENT GREEN POWER - POOR RETAIL INVESTORS RESPONSE. The issue which closed yesterday got overall 1.07 times subscription. The issue received very poor response from retail investors. It got subscription only to the extent of 18% of the shares reserved in the category. Ramky Infra managed to get almost one time subscription from the investors in the retail sector. However, the IPOs of Career Point, Eros , Microsec and Electrosteel Steels received good retail response. Ashoka Buildcon received 90% subscription (over all) on the first day of opening. Labels: ORIENT GREEN POWER - POOR RETAIL INVESTORS RESPONSE. The government is likely to fix the price band for the mega IPO on 12 of OCT. The biggest IPO in the history of Indian capital market will open for public on 18-10-10. The market regulator has rapped the investment bakers, for keeping the issuers interest above the investors. The investment / merchant bankers are trying to kill the golden goose. They are interested only in their fees, survival. They, most of the time keep the interest of the promoters above that of the share holders. Some times, because of their suggestions, issues are priced aggressively. Out of the 42 issues that listed since January 2010, every second issue is quoting below the offer price. SEBI should also do something to the menace of grey market operations. Grey market creates artificial demand for the shares. Unsuspecting investors are being lured into the business. Once the operators achieves their target, share are dumped in the market leaving no chance for investors to cover their risks. The IPO and listing of Aster Silicate is a classic example. The poor quality IPO, after having arisen more than 100% within two days of listing, hit the lower circuit for 5 consecutive days, after that. The investors, including those who participated in the grey market trading had no clue of what is happening. The shares, issued at Rs 118/- are now trading around Rs 55/-. Similar things are likely to happen for nearly four issues that rushed to the market this week. SEBI, please keep a special watch on all the IPO listings, that entered the market in Sept 2010. Labels: SEBI RAP S INVESTMENT BANKERS. IPO NEWS : TECPRO SYSTEM ROPES IN ANCHOR INVESTORS. Eight anchor investors were roped in at Rs 355/- (upper band) by the company. Birla Sunlife, Franklin India, Nomura India Stock, Copthall Mauritius Investments, Sundaram BNP Paribas FD Growth, Sundaram BNP Paribas CAPEX, and Axis bank are the anchor investors. The total shares allotted are 13.23 lac shares. FIRST CHOICE RECOMMENDS SUBSCRIPTION TO THE ISSUE. The Nashik based steel wire manufacturer – Bedmutha Industries Limited, is entering the capital market on 28-09-10, with issue of 90,00,000 equity shares of Rs 10 FV, in the price band of Rs 95-102. The issue closes on 1-10-10. Keynote Corporate Services and Ashika Capital Limited are the BRLMs. Kachardas R. Bedmutha is the founder of Bedmutha Industries Limited (formerly known as Bedmutha Wire Company Limited). He has more than thirty years experience in the business. The Company started its commercial production in the year 1992, by setting up first Galvanized Wire plant at Nashik with an installed capacity of 3600 MTPA. The company has an established track record of about two decades in the wire manufacturing business. Over the past years, the company has significantly increased the capacities of its wire drawing and galvanizing units, which has led to healthy growth in production levels. The galvanizing unit witnessed 25% growth in production in FY 2010 as compared to the previous year and further growth would be aided by addition of new galvanizing line in March 2010 that has increased the galvanizing capacity from 25,300 MTPA to 33,500 MTPA. The Company’s products find usage in infra, automobile, engineering and defence, among others. The company has a subsidiary- Kamalasha Infrastructure & Engineering Private Limited, for undertaking turnkey contracts for infrastructure namely in power, roads, railways etc. The company has also invested 49% in Ashoka Pre-con Private Limited along with Ashoka Buildcon Limited, (IPO for this company opens on 24-09-10) to manufacture pre stress concrete products such as cement poles, RCC pipes, Cement Piles, railway sleepers. For Setting up of a new plant at Sinnar, Nashik for manufacturing of Low Relaxation Pre-Stress Concrete (LRPC) Wire and Spring Steel Wire ( Rs 85.00cr) and General Corporate Purposes (Rs 6.80cr). IPO grade 2 by ICRA, indicating below average fundamentals. The company faces competition from large sized players in the industry, having wider product portfolio such as Tata Steel Ltd., Usha Martin Ltd. and Ramsarup Industries Ltd. Further, the company also faces competition from number of smaller units in wire drawing business, though the company’s emphasis on quality mitigates the competitive pressures to some extent. The project has not been appraised by any external agency. Although ,the demand outlook for both LRPC and Spring Steel Wires is favorable, the company’s ability to implement the project in a timely manner and ensure market acceptance for the products would be critical for generating returns on the investment planned. At Rs 95-102, the issue is priced around 17 times its FY 10 earnings, on post issue capital of Rs 21.02cr. This is expensive compared to the listed peers in the segment like Good Luck Teel Tubes (3.5PE) and Ramsaup Industries (9PE). While the IPO should enable the company to scale up its revenues, the actual return indicators may decline given the large size of expansion, the significant equity dilution and uncertainty on the company’s ability to get market acceptance for its new product offerings. The offer is expensive. AVOID. IPO NEWS: TECPRO SYSTEMS OPENS TODAY. The New Delhi based material handling company's IPO opens today. The issue consists of fresh issue of 62, 50,000-equity shares and offer for sale of 13, 00,000equity shares, in the price band of Rs 340-355. FIRST CHOICE IPO RECOMMENDS SUBSCRIPTION TO THE ISSUE. SEARCH THIS BLOG FOR DETAILED ANALYSIS. The issue is being lead managed by Chartered Capital And Investment Limited, who lead managed the Syncom Healthcare in Jan 2010. As against the issue price of Rs 75/- the shares are now quoting at Rs 41 in the exchanges. Another issue from the same lead manager. Sea TV Network Limited (STNL), an Agra based company engaged in providing services of Multi System Operator (MSO) to Local Cable TV operators, is entering the capital market on 27-09-10, to raise funds to the extent of Rs 50.20cr, in the price band of Rs 90-110. The issue closes on 29-09-10. Sea TV Network is an Agra based company engaged in providing services of a Multi System Operator (MSO) to Local Cable TV operators of Agra city. The company was incorporated in2004. The promoters of Sea TV, Neeraj Jain, Mr. Akshay Kumar Jain, and Pankaj Jain are in this line of activity since about 16 years and are well conversant with the Cable TV industry. Sea TV is one of the three existing MSOs in Agra City. Sea TV also has its own local channels, programmes, produced by its own production team. The local channels mainly focus on Agra city/U.P State news/events and information, which is more relevant to the local viewers. These channels are broadcasted free of charge to the TV subscribers of Sea TV. The IPO Grade 1 assigned by ICRA reflects risks arising out of STNL’s small scale of operations, significant expansion plans in relation to its existing operations, geographic concentration risk arising out of presence in only one city - Agra. Shares will be listed only at BSE. The company is yet to obtain and maintain certain governmental and regulatory licenses. “YOUR TV” on August 12, 2010. All applications are pending as on date. The Company yet to apply to the National Highways Authority of India for permission to lay underground cables in areas in the city of Agra. The Company is yet to place orders for Rs.4450.25 lacs, being 100% of the plant & machinery cost relating to the project. Competition from DTH service providers. Companies like TATA SKY, DISH TV, BIG TV and other all India players are trying to have presence by using the DTH platform for providing TV programmes through satellite. The company also faces competition from other Multi System Operators (MSOs). The company operates in a highly competitive environment. The company does not own the registered trademark -“Sea TV”. A small time MSO company. On a turnover of Rs 9.46cr for FY 10, the debtors outstanding are Rs 6.62cr (almost 70%). It is an indication of, how severe is the competition. The company is demanding a valuation, around 45 times, its FY10 earnings. The valuation is sought, is equalant the valuation of some listed MNCs. IPO NEWS: EROS ROPES IN ANCHOR INVESTORS.